Join me on a journey into the unknown, where what you think you know melts away and is replaced by something something bigger. For decades I have been drawn to sacred sites and powerful places, drawn to go on pilgrimage across France and Spain, drawn to place my feet in the footsteps of if not my ancestors then of the ancestors of spirit who have traveled these paths before me. Like iron pulled toward a magnet, I have sought out well- and little-known places of power ancient stone circles, half-buried dolmens, ruined Romanesque chapels, spire-topped inspiring cathedrals, thick forests, hidden holy wells, dark sacred caves. Seeking I knew not what, going I knew not why, except that I was driven by a simple but all-consuming question: What are these places? I think I hoped that, by going to enough of them, I would find the answer. The first time I knew I was in a very powerful place was when I saw the alignments at Carnac in Brittany, France. My husband, Gary, and I had driven through the flat Breton maritime pine forest toward the coast. The nearly straight road reached a crossroad and there, behind green metal fencing, were rows of large, upright stones, some as tall as a person, stretching in rows as far as the eye can see. Brakes screeching, we pulled over. I jumped out and ran across the lane, twining my fingers through the barrier to get as close as I could. What were they? Who put them here? What purpose did they serve? And thus began a journey of discovery, a gradual journey from skepticism to belief with conclusions based not on faith but on experience. This journey has had many twists and turns, meandering its way with guidance from unexpected sources. For example, years ago Gary and I visited the Romanesque cathedral in Le Puy en Velay, in south-central France, its stunning fa ade constructed of alternating layers of beige sandstone and black volcanic breccia. Le Puy is the starting point for one of the four medieval pilgrimage Ways of St. James that spread like fingers of a hand across France to the Pyrenees, where they join the Camino de Santiago. A pleasant Frenchman whom we encountered in the cathedral offered to point out the hidden energies of the place. Of course we said yes, curious about what he meant. At one point he pulled out a pointed crystal pendulum attached to a short chain. I d never seen such a thing. My surprise was obvious, and he smiled. He told me to pull a hair out of my head, take off my wedding band, fasten the hair through the ring, and then, holding the end of the hair between two fingers, ask the ring to spin in one direction for yes, the opposite direction for no. Much to my amazement, it did. He then had me stand over a place he said was an energy spot and ask the pendulum a specific question. The pendulum responded. How curious, I mused, as I unfastened the strand of hair and put my ring back on my finger. Perhaps I was just very suggestible, I chided myself, and then intentionally thought no more about it. Despite my initial skepticism, I became seriously interested in earth energies because I wanted to learn more about powerful places and sacred sites. Gary and I began studying with several teachers who knew a lot about these topics. We learned there is a body of knowledge or more accurately, several bodies of knowledge called geomancy, Zahor Arts, Earth Mysteries, Feng Shui, etc. Some of this knowledge has been passed down through the millennia. Some of it is being rediscovered through modern research, including archaeo-astronomy computer programs, magnetometers, and other high-tech devices. The megalith builders used some of this knowledge or gnowing, a term used by Sig Lonegren 4,000, 5,000, 6,000 years ago to construct complex stone circles, standing stones, and earth-covered stone enclosures oriented toward certain stars or marking the recurrent cycles of the sun or moon. Rather than being primitive folks who knew little, these ancient Master Builders knew a great deal much of which we have forgotten and are only now reclaiming. The Master Builders of Egyptian temples, medieval churches, and Gothic cathedrals used some of this knowledge to carefully situate and meticulously construct these sacred sites in order to create specific energetic and emotional experiences. These are places where Heaven (the Cosmos, Divine Consciousness) and the living Earth unite. It s not by chance you feel something in these places, nor is it a figment of your imagination. Perhaps you doubt me. After all, I doubted myself too, years ago. It s only been through repeated exposure and diligent study that I have come to give credence to what I have experienced. Thanks to excellent teachers (including Dominique Susani, Sig Lonegren, and Ferran Blasco, with whom I have just written a book) I have learned not to take any of this on faith but also not to deny reality. The original question that compelled me on my travels was, What are these sacred sites? After encountering a number of them and writing books and essays about them, my question expanded to something like, What is the relationship between me, the living Earth, and the Cosmos? Ultimately, this journey has led me to reconsider what is reality. It is obviously much different from what I used to think. Much bigger, more expansive, vibrational more conscious, if you will. I have been to sacred sites where I have experienced our agreed-upon consensual reality suddenly changing. 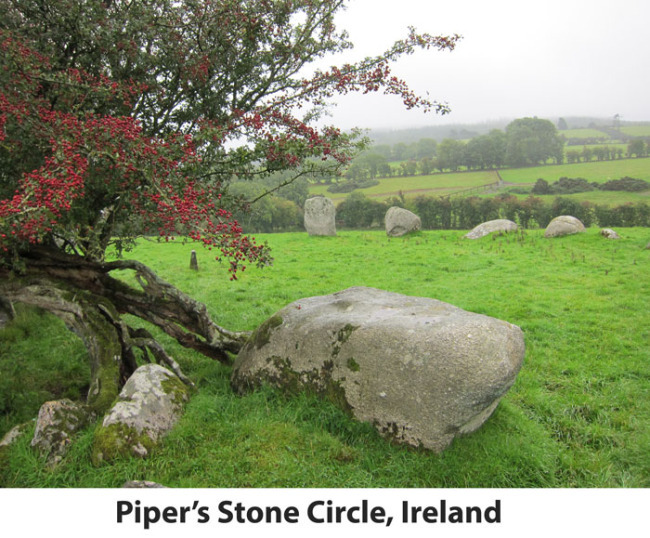 Like the time when, after marching rapidly around a stone circle, my companions and I could see something like smoke rising off the top of the stones. Or where, after consciously, intentionally entering into a church and pausing in a deliberate way under various vaulted arches, I could feel a shift in my own energy. 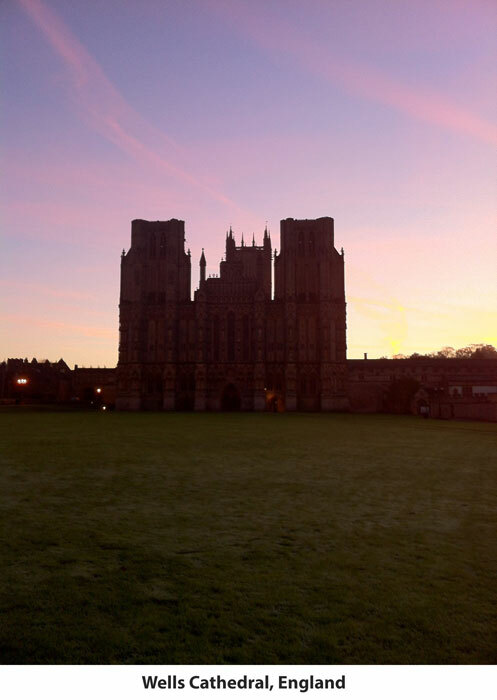 Or another time, when walking over a grassy lawn toward Wells Cathedral on a mist-filled night, I felt the cathedral as a sentient being not a human consciousness but nonetheless conscious. Another time, standing on a spot inside a tiny eleventh-century church, I suddenly felt the walls dissolve around me and was catapulted into an expanded awareness where the I I thought I was had no boundaries and was floating in an immense, brightly lit darkness beyond time, space, and movement, beyond words. It was as if years of meditation practice had coalesced into a moment. Over the years my question has changed to yet a different question, perhaps best summarized as Who am I? What is my true identity? Visiting sacred sites has expanded my awareness. It s not the only way to achieve this, but it has worked for me. As a result, my outer journey to powerful places has shifted to an inner journey into Consciousness and ultimately, to the recognition that, in fact, there is no outer and inner : there is only the sacred. Whenever we become aware and awake, we recognize that we are where Heaven and Earth unite. Where Heaven and Earth Unite by Elyn Avivia and Ferran BlascoElyn Aviva and Ferran Blasco are co-authors of the new book, Where Heaven and Earth Unite: Powerful Places, Sacred Sites, and You. PURCHASE Where Heaven and Earth Unite: Powerful Places, Sacred Sites and You. Elyn is also co-author with her husband, Gary White, of Powerful Places Guidebooks. To learn more about their publications, go to www.powerfulplaces.com, www.powerfulplaces.info blog, and www.pilgrimsprocess.com. Discover Elyn's fiber art at www.fiberalchemy.com.